Based in Paris, France, the MatériO Group hosts permanent design exhibitions all over the world. In cities where leading designers are gathered together, a MatériO showroom can be found: from Paris to Shanghai, from Brussels to Prague and from Seoul to Shenzhen. 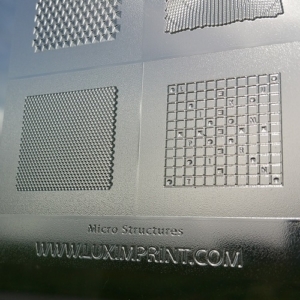 Luximprint proudly presents it full sample collection at any of the exhibition areas – including it’s 3D printed optical plastics, textured surfaces and Optographix. Apart from the Luximprint samples, any of the exhibitions provides a home to thousands of singular materials, product and technology samples, classified by families. A sparkling and creative place, where design professionals can come to manipulate and to get inspired… Call it a true Aladdin Cave for designers! MateriO’ Online hosts over 7,000 amazing ID cards with novel materials, and more than 5,000 contact details of manufacturers. In addition, the virtual material library houses an entire set of research references, carefully selected by the MateriO’ team. The online tool offers extensive answers to member’s queries, thanks to surprisingly intuitive, user-friendly and original research functions. A must-have for designers! Both the physical and online databases are updated on a daily basis and grow through the addition of the latest novelties on an international scale. In addition, the MateriO’ Group is curator of the M4 international exhibition in Paris, which will take place in March 2018. On site, 200 major innovations will be presented.